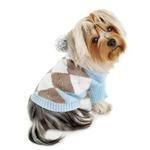 Bundle your dog up in a classically stylish Argyle Pattern Hoodie Dog Sweater from Klippo in Light Blue! Posted On 03/05/18 by Amy from southern California, CA Yes, Amy recommends this product! What's not so great: -- pulled threads -- i.e., The large silver stitching that makes a visible "X" pattern down the back of the sweater is pulled/loose in several places. This is not the end of the world, but it does detract from the sweater's otherwise flawless appearance and is disappointing to find in a brand new sweater. This is the only reason I am rating it 4 stars instead of 5. We are keeping the sweater, due to all of the good points listed above. Love the adorable style, fabric and fit! I only rated this sweater with four stars because it does not have a leash hole. I was disappointed. I was hoping to use a harness underneath it and use the sweater on spring days when our pup wouldn't need a coat, but would need something lighter in weight just to keep the chill off him. I'm going to experiment with putting a harness with it, but may find that the hoodie on the sweater will make it much more difficult to attach and pull up the leash through the neck of the sweater. I'm going to try to make it work because I love the style, color, pattern, and softness of the sweater. It's really cute! But if I can't find a way for my dog to wear it outdoors, what is the point of having it? I'll have to return it for a store credit. And it's not an inexpensive sweater to say the least. So I want to make sure I get my money's worth with my dog being able to wear it frequently. Posted On 03/30/17 by Grayce B from Milford, Yes, Grayce B recommends this product! Absolutely adorable. Well made. Love the pompom. This Argyle Pattern Hoodie Dog Sweater is just too cute!!! My Chinese Crested looks so adorable in this!!! !